Direct petrol injection is the latest technology in injection systems – you’ll find it in models from Mazda, Audi/VW, BMW and Alfa, amongst others. But how does it work? 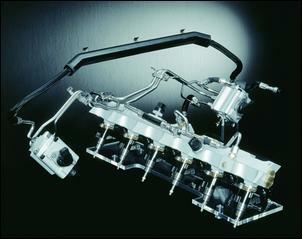 As the name suggests, Direct Petrol Injection uses injectors that add fuel directly to the combustion chamber. Like diesel engines, the air/fuel mixing occurs inside the combustion chamber, rather than in the inlet ports. Taking this approach gives far greater control over the combustion process, allowing for a variety of combustion operating modes, including those having ultra-lean air/fuel ratios. 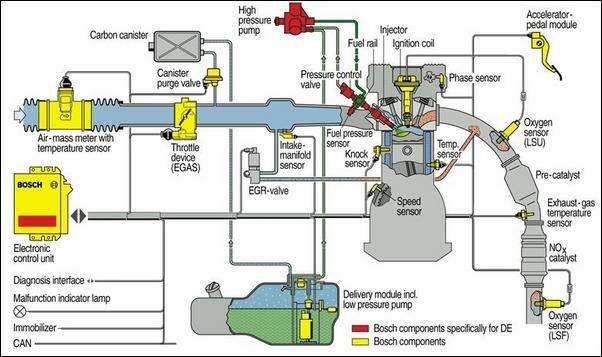 This diagram shows the layout of the Bosch direct injection system. 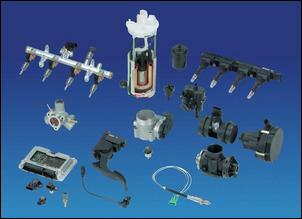 Direct injection systems differ from conventional port injection in several ways. The fuel supply system uses two fuel pumps – a conventional electrical fuel pressure pump (in the past dubbed a high pressure pump but now referred to in this system as a low pressure pump) and a mechanically-driven high pressure pump. The low pressure pump works at pressures of 0.3 – 0.5 MPa while the high pressure pumps boost this very substantially to 5 – 12 MPa. The high pressure fuel is stored in the fuel rail that feeds the injectors. The fuel rail is made sufficiently large that pressure fluctuations within it are minimised as each injector opens. The pressure of the fuel in the injector supply rail is controlled by an electronically-controlled bypass valve that can divert fuel from the high pressure pump outlet back to its inlet. The fuel bypass valve is varied in flow by being pulse-width modulated by the Electronic Control Unit (ECU). 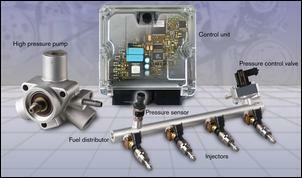 A fuel pressure sensor is used to monitor fuel rail pressure. 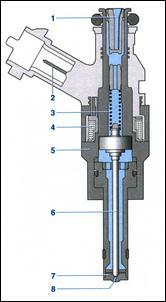 This diagram shows a cross-sectional view of an injector. Compared with a conventional port fuel injection system, the fuel injectors must be capable of working with huge fuel pressures and also injecting large amounts of fuel in very short periods. The reason for the much reduced time in which the injection can be completed is due to the fact that all the injection must sometimes occur within just a portion of the induction stroke. Conventional port fuel injectors have two complete rotations of the crankshaft in which to inject the fuel charge – at an engine speed of 6000 rpm, this corresponds to 20 milliseconds. However, in some modes, direct fuel injectors have only 5 milliseconds in which to inject the full-load fuel. The fuel requirements at idle can drop the opening time to just 0.4 milliseconds. Direct injection fuel droplets are on average only one-fifth the droplet size of traditional injectors and one-third the diameter of a human hair. The very lean air/fuel ratios at which direct injection systems can operate results in the production of large quantities of oxides of nitrogen (NOx). As a result, direct injected cars require both a primary catalytic converter fitted close to the engine, and also a main catalytic converter - incorporating a NOx accumulator - that is fitted further downstream. So that’s the mechanical make-up – now, how does the system work? 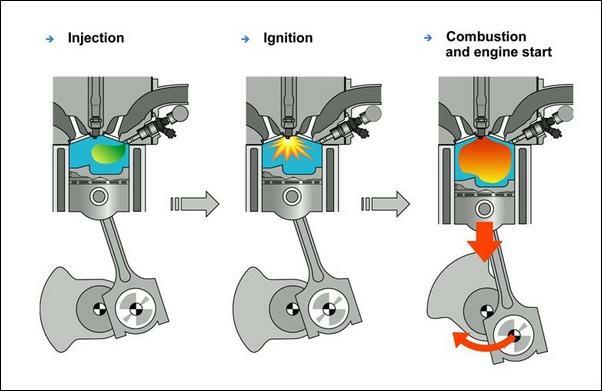 The really radical nature of direct fuel injection can be seen when the different combustion modes are examined. There are at least six different ways in which combustion can take place. 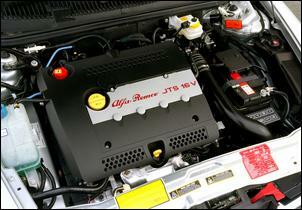 At low torque output up to about 3000 rpm the engine is operated in Stratified Charge Mode. In this mode the injector adds the fuel during the compression stroke, just before the spark plug fires. In the period between the injection finishing and the sparkplug firing, the airflow movement within the combustion chamber transports the air/fuel mixture into the vicinity of the sparkplug. This results in a portion of relatively rich air/fuel mixture surrounding the sparkplug electrode while the rest of the combustion chamber is relatively lean. The gas filling the rest of the chamber often comprises recirculated exhaust gases which results in a reduced combustion temperature and so decreased NOx emissions. In Bosch direct injection systems, the air/fuel ratio within the whole combustion chamber can be as lean as 22:1 – 44:1. Mitsubishi states that total combustion chamber air/fuel ratios of 35 – 55:1 can be used. This can be compared with a conventional port fuel injected engine that seldom uses an air/fuel ratio leaner than 14.7:1. 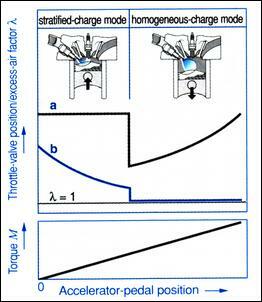 Homogenous Mode is used at high torque outputs and at high engine speeds. Injection starts on the intake stroke so there is sufficient time for the air/fuel mixture to be distributed throughout the combustion chamber. In this mode Bosch systems use an air/fuel ratio of 14.7:1 (the same as with port fuel injection at light loads), while Mitsubishi use air/fuel ratios from 13 – 24:1. In the transition between Stratified and Homogenous Modes the engine can be run with a homogenously lean air/fuel ratio. Initially, this mode doesn’t seem to make sense – how can the combustion process be both homogenous and stratified? However, what occurs is not one but two injection cycles. The initial injection occurs during the intake stroke, giving plenty of time for the fuel to mix with the air throughout the combustion chamber. Then, during the compression stroke, a second amount of fuel is injected. This leads to the creation of a rich zone around the sparkplug. The rich zone easily ignites, which in turn ignites the leaner air/fuel ratio within the remainder of the combustion chamber. Of the total fuel addition, approximately 75 per cent occurs during the first injection and 25 per cent in the second. The Homogenous Stratified Charge Mode is used during the transition from Stratified Charge to Homogenous Modes. This diagram shows the two primary combustion modes – stratified charge and homogenous modes. As was indicated earlier, the injectors must be opened against very high fuel pressures. So that this can happen, a peak/hold strategy is employed where the opening current is very high and the ‘hold’ current much reduced. A dedicated triggering module is used to control the injectors, with a booster capacitor providing 50 – 90 volts to initially open the injector. The sensing of how much gas is in the cylinder is more complex on a direct injected engine than a conventional port injected engine. 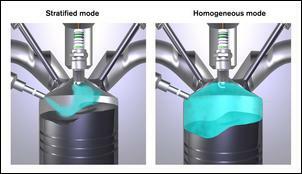 This is because at times recirculated exhaust gas forms a major component of the total cylinder charge. As a result, two cylinder charge sensors are used. These comprise a conventional hot-film mass airflow sensor (ie similar to a hot-wire airflow meter) and a manifold pressure sensor (MAP sensor). The flow through the airflow meter is used as an input into the calculation of the pressure within the intake manifold and this is then compared with the actual intake manifold pressure measured by the MAP sensor. The difference between the two indicates the mass flow of the recirculated exhaust gas. As with many conventional engine management systems, direct injection requires the use of an electronically-controlled throttle. However, unlike conventional systems where the actual throttle opening more or less follows the driver’s accelerator pedal torque request, in the case of direct injected engines, for much of the time the throttle is fully open - engine torque output is instead regulated by varying the fuel delivery, just like a diesel. This diagram shows how this occurs. During Stratified Charge Mode the throttle (indicated by ‘a’) is held wide-open, irrespective of the driver’s accelerator pedal input. When the torque request is low, the air/fuel ratio is very lean (Bosch refer to this as an increased ‘excess air ratio’ – line ‘b’), with the air/fuel ratio gradually becoming richer as more torque is required. At a certain point, which corresponds on an engine-specific basis to engine speed and the amount of torque required, the engine changes to Homogenous Mode. (For simplicity, the transitional Homogenous Lean-Burn Mode is ignored in this diagram.) With the change in modes, the throttle valve opening becomes related to the driver’s torque request and the air/fuel ratio holds a constant stoichiometric air/fuel ratio (that is, 14.7:1 or Lambda = 1) across the rest of the engine load range. The system incorporates an operating-mode co-ordinator which maps operating mode against engine speed and torque request. 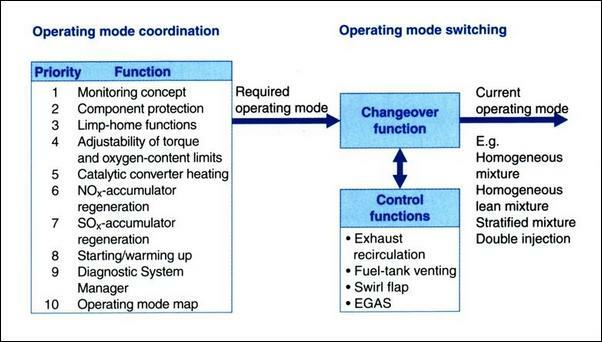 This diagram shows a schematic diagram of the functioning of this controller. As can be seen, a 10-stage prioritisation is used when deciding on the required operating mode. Before the selected combustion mode starts to occur, control functions for exhaust-gas recirculation, fuel tank ventilation, charge-movement flap (ie port tumble valves or variable length intake manifold), and electronic throttle settings are initiated as required. The system waits for acknowledgement that these actions have been carried out before altering fuel injection and ignition timing. The advantage of having the electronic throttle valve fully open at low loads is a huge reduction in pumping losses – the engine is no longer trying to breathe through the restriction of the nearly-closed throttle. (A similar scheme is used in the latest Honda Civic but it is achieved through valve timing changes.) However, the downside of this approach is that the partial vacuum that is normally available for the brake booster is lacking. To overcome this problem, a vacuum switch or pressure sensor monitors brake booster vacuum and if it is necessary, the combustion mode is altered so that vacuum again becomes available. In addition to the reduction in pumping losses occurring as a result of the throttle being wide open at low loads, during Stratified Charge Mode thermodynamic efficiencies are also increased. This is because the rich cloud of combustible air/fuel mixture around the sparkplug is thermally insulated by the layer of air and recirculated exhaust gas that surrounds it. Together with the much leaner air/fuel ratios than can be used in a conventional port injected engine, the result is a fuel efficiency improvement that can be up to 40 per cent at idle. Mitsubishi state that at 35 km/h their direct injected engines use 35 per cent less fuel than a comparably sized conventional engine and that in the Japanese 10-15 Urban Driving Cycle (albeit a slow speed cycle), the direct injected engine uses less fuel than even a comparable diesel engine. During homogenous mode operation, both the use of an air/fuel ratio that is never richer than 14.7:1 and the higher compression ratios normally associated with direct injection engines result in a fuel saving of about 5 per cent. Mitsubishi has been building direct injection petrol engines since 1996, but they have not been able to achieve worldwide success with their designs due, it is said, to the engines’ reliance on high quality fuel. Now Bosch has developed technology which is allowing direct injected engines to be sold around the world. Combine direct injection technology with the hybrid cars being widely developed – plus perhaps downsized and turbocharged engines - and we’re certainly in for some interesting times ahead. Another advantage of Direct Injection is that it is possible to start a hot engine without using the starter motor. This approach also reduces start-up hydrocarbon emissions, making more attractive the use of engines that automatically switch off once the car has been stationary for a period.